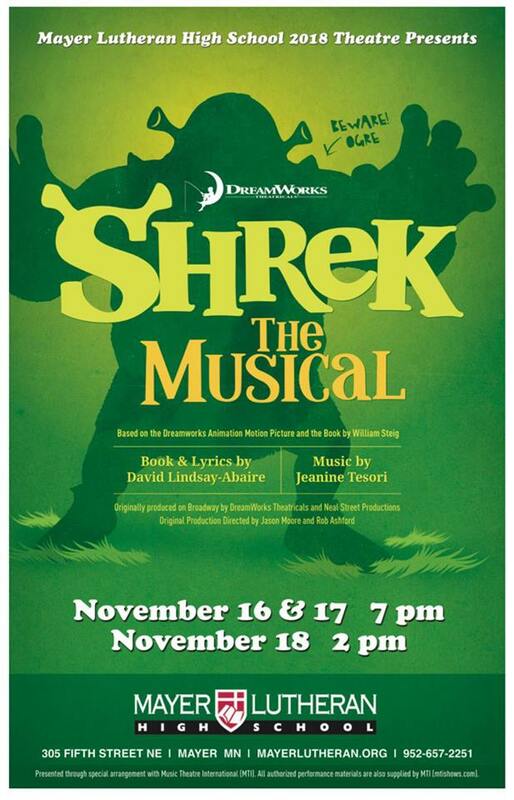 Shrek the Musical comes to the MLHS Fine Arts Auditorium stage Friday and Saturday, November 16 and 17 at 7 PM and Sunday, November 18 at 2 PM. Tickets are available at the door – $10 for adults and $7 for students. Based on the Oscar-winning DreamWorks Animation film, Shrek The Musical is a Tony Award-winning fairy tale adventure, featuring all new songs from Jeanine Tesori (Thoroughly Modern Millie; Caroline, or Change) and a sidesplitting book by David Lindsay-Abaire. Shrek brings all the beloved characters you know from the film to life on stage and proves there’s more to the story than meets the ears. Irreverently fun for the whole family, Shrek proves that beauty is truly in the eye of the ogre.